Home » Lee Edition » SHOULDER REPLACEMENT DONE WITHOUT A HOSPTIAL STAY? Local surgeon utilizes new, innovative techniques to improve patient experience and outcomes. SHOULDER REPLACEMENT DONE WITHOUT A HOSPTIAL STAY? Local surgeon utilizes new, innovative techniques to improve patient experience and outcomes. Arthritis is a condition that occurs in various joints in the body, including the knees, hip, spine, and also, the shoulder. When arthritis occurs, the cartilage that covers the ends of the bones making up the joint breaks down, flaking off into the joint. The joint becomes swollen and stiff, and the lining tissue of the joint (the synovium) becomes overgrown and painful. The pain can vary from mild to very severe, depending upon many factors, including the severity of the disease, the type of arthritis, and the activity level of the patient. When the shoulder becomes arthritic, the joint becomes stiff, feels heavy, and fatigues easily. Many patients will feel their shoulder grind and even “catch” or get stuck in certain positions or with certain activities. These symptoms typically worsen with time much as the tread on the tires of your car continue to wear, eventually with belts inside the tires becoming exposed. When this happens in the shoulder, raw bone becomes exposed, resulting in more significant symptoms that often become disabling. The treatment of shoulder arthritis depends on how much pain or dysfunction is experienced. Physical therapy exercises in the pool may be soothing, help maintain range of motion of the joint, and strengthen the surrounding muscles. Medications (i.e, Ibuprofen, Naprosyn, Celebrex) and supplements (i.e, Glucosamine, Chondroitin Sulfate, Tumeric) may help to ease the symptoms of arthritis. Cortisone injections are commonly used to control symptoms when pills no longer are effective. In severe arthritic disease, if medications and injections have failed, the most reliable treatment is shoulder replacement. This is an area where Dr. Mehalik has dedicated more than 15 years of his career to continually improve shoulder replacement techniques. More than 90% of his patients now have this surgery done as an outpatient (with no overnight hospital stay) and less than half take any opioid pain medication after the surgery due to these advanced techniques. This is accomplished through the use of a minimally invasive surgical approach (incision as small as 2.5 inches) and advanced anesthesia techniques including the use of specialized medicine used to numb the nerves that supply the shoulder for 48 to 72 hours after surgery. This allows patients to feel very little, if any, pain for the first several days after surgery and recover in the comfort of their own home rather than in the hospital. Two different styles of total shoulder replacement have been developed and are utilized in different situations. 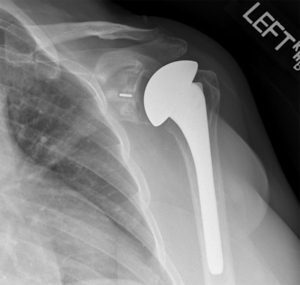 In anatomic shoulder replacement, the natural anatomy of the shoulder is preserved, replacing the native ball with a metal ball and the native socket with a plastic socket. This device requires a healthy rotator cuff to function properly and will essentially mimic the natural anatomy and function of the shoulder. If the rotator cuff tissue cannot be relied upon, Dr. Mehalik uses reverse shoulder replacement, where the native socket is replaced by a metal ball and the native ball is replaced with a metal stem attached to a plastic cup. Reverse shoulder replacement recruits other muscles around the shoulder girdle to act in the absence of rotator cuff function. Because there is little pain after surgery, Dr Mehalik advises his patients to begin exercises the day after surgery, and include movement of the elbow, wrist and hand, and exercising the grip. Shortly thereafter, rotational pendulum exercises can be added. Gentle strengthening exercises begin at about two to three weeks when the brace or sling is removed. Incredibly, the shoulder may generally be used for daily activities (with minor restrictions) within a month. You can begin training for return to golf, tennis, or other athletic activities as early as 8 weeks post operatively. While the new shoulder will continue to improve in strength, coordination, and endurance for up to a whole year, Dr. Mehalik routinely releases his patients to full, unrestricted activity by 10-12 weeks after their surgery. John Mehalik, MD is a Board Certified, Fellowship-Trained Orthopedic Surgeon specializing in arthroscopic and minimally-invasive reconstructive surgery of the shoulder and knee. Dr. Mehalik completed a bachelor’s degree from both Miami University and Case Western Reserve University, then his master’s degree in biomechanical engineering at the University of Cincinnati. He attended medical school and orthopedic surgery residency at the Medical College of Ohio and finished his fellowship training in arthroscopic and reconstructive shoulder and knee surgery at the world-renowned Southern California Orthopedic Institute in Los Angeles. His expertise and experience have distinguished him as an authority in the diagnosis and management of both common and complicated knee and shoulder problems.